Peder Pettersen Benerud was born at the husmansplass Benerud, attached to the farm Vestgam Aas at Eidsvoll, Norway, son of Petter Olsen Benerud and Berthe Paalsdatter Siggerud. 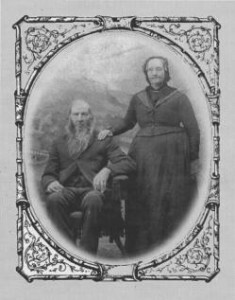 He had one brother, Andreas Pettersen (1826-1841); one sister, Elen Pauline Pettersdatter (1828-1849), and one half-sister, Christiane Pedersdatter (1812- ? ). Christiane was the daughter of Berthe and her first husband, Peder Christophersen Benerud, who was husmann at Benerud before Petter. She married Ole Blikkelsrud and, they were the recipients of the Benerud letters sent back to Norway in 1875 and 1882 and given by their grandson Olaf Blakkisrud to Charles Benrud in 1945 and 1948. Anne Soffie Jonsdatter was born at the husmansplass Øvrebakken, also attached to Vestgam Aas, daughter of Jon Christophersen (brother of Peder Christophersen Benerud) and Johanne Iversdatter. In 1829 the family moved to the farm Østby. Her sister Margrethe Jonsdatter married Johannes Østby, son of Nils Jonsen and his wife Ingeborg Paalsdatter Siggerud, sister of Berthe Paalsdatter. Peder and Anne Soffie were married ca. 1842 and Peder succeeded his father as husmann at Benerud. Berthe lived with them until her death at the age of 88, paralyzed the last 17 years as a result of a stroke. Along with farming, Peder was in the livery business. In 1875 Peder and Anne Soffie and their three youngest children came to America to join their three older children who had come previously. On June 6, 1875 they left for Bergen on the Thondhjem and there on June 6 boarded the Haakon Adelsten (a combination steam and sail boat) for New York, where they arrived on June 24. Then they came to Sparta, Wisconsin by train and joined the earlier arrivals near Cashton. There they lived the rest of their lives with their son Anton. Peder and Anne Soffie had eight children: Maren Jonette (1843-1931); Berte Marie (1847-47); Berte Caroline (1848-1935); Karl Johan (1851-54); Anton (1854-1917); Olava Karn (1856-1943); Karl (1858-1912); and Christian (1860-82).